Chocolate Chunk Cookies and Chocolate Chunk Brownies are the recipes for chocolate lovers! A classic dessert, easy to bake and an amazing accompaniment with a large glass of milk. Each by itself is extremely pleasant, imagine if you combine them! No one really knows who invented brownies but the first chocolate brownies recipe ever published was called “Brownie’s Food” and it appeared in the book “Machias Cookbook” around 1899. That recipe is similar to the popular ones we see today with chocolate chunks (chocolate chips themselves were invented later by the Toll House Restaurant and Inn), flour, milk and baking powder. What about the cookie part? Everyone agrees that chocolate chip cookies were invented in 1937 by Ruth Graves Wakefield, the owner of the Toll House Restaurant. Ruth was out of baker’s chocolatewhich she normally chunked into pieces using a knife, so she tried to replace it with chunks of a semisweet chocolate bar, expecting these would melt. The chunks of chocolate kept the shape and she decided to name them Toll House Crunch Cookies. She later made her own chips using melted chocolate and a spoon. She eventually hired Nestle to make the chocolate chips for her and that is the story of the chocolate chip invention. In some places the combination of chocolate chip cookie dough and brownies is called “Brookie” (Blondie by some) and that is what we are going to bake today! I recommend using high quality chocolate and cocoa powder to make this recipe. 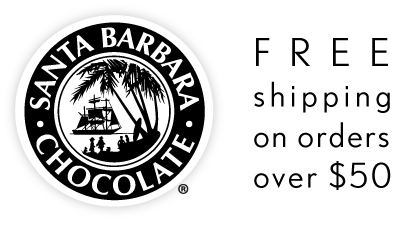 Because I’m the chocolatier for Santa Barbara Chocolate, I’m going to use a selection from our online store Santa Barbara Chocolate. Melt your butter, you can do this either in the microwave or in a little saucepan. Add your Rainforest Baking Cocoa Powder, previously sifted into the melted butter. Stir until completely combined. Incorporate sugar and salt into the same mixture of butter and cocoa powder, keep stirring well. Set apart to let it cool down. In a large bowl, beat your eggs until light and foamy. When cooled down, add the cocoa powder mixture into the bowl. Sift in the all purpose flour. Add the Belgian Dark Chocolate chunks. Whisk all the ingredients until mixed. Do not over mix, unless you want brownies with cake texture. Set aside the bowl with the brownie batter and start the chocolate chunk cookie dough. Cream together room temperature butter, salt and sugar. When the butter and sugar are completely combined and creamy, add the egg and keep whisking. Add the all purpose flour and cornstarch, both previously sifted, and continue stirring until all is integrated. Take Milk Chocolate Couverture and cut it into chunks or just hand crush it. Add the chunks into the cookie dough, fold them in. Pour your vanilla extract and give it a good stir. Chill the dough for 10 minutes before baking it. Line a 8 x 8 inches baking square pan with parchment paper. Pour half of the brownie batter and spread it with a spatula or the back of a spoon. Add about a third of the cookie dough; place small balls around the pan and with the tip of a knife - make large swirls to help combine with the brownie batter. Add the remaining brownie batter and remaining cookie dough, again, make some swirls with the tip of a knife. Bake for 20 minutes at 350F or until the cookie dough looks golden. Let it cool down before cutting the brownie bars. To make it even more delicious, add some homemade chocolate sauce on top!